The Wistful Vista Telephone Company is no longer actively selling, restoring, or repairing telephones. We are leaving our website up for informational purposes. From time to time, we may be selling off some of our surplus inventory, so you may want to check back occasionally. Anything we post on eBay will also be posted here. In 1925, Western Electric introduced its first handset telephone, the A1. The A1 telephone was produced in limited quantities and is extremely scarce today. The A1 handset mounting consisted of a brass base and a short-stemmed cradle and plunger made of an aluminum alloy. The A1 cradle accommodated the newly designed E type handset. Like its desk stand predecessors, the A1 also required a bell box. The A1 base is identical to the base used on a dial desk stand, except no patent information is stamped on the edge of the A1 base. The patent information on an A1 is located on the short cradle stem. By 1927, the A1 was replaced by the B1 desk telephone. Equipped with the same E1 handset, the B1 had a somewhat higher profile round base made of stamped steel and an aluminum alloy cradle and plunger. 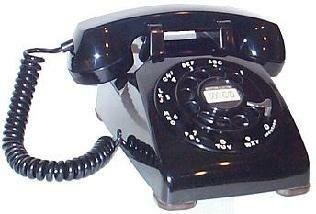 The B1 is often called a “102,” a BELL SYSTEM designation for a sidetone handset desk telephone. However, B1 sets were configured for both sidetone (102) and anti-sidetone (202) service. Western Electric's first handset for production telephones was the E handset, pictured on the left, introduced with the A1 telephone about 1925. E handsets had five bakelite parts: the handle, the mouthpiece, a thick lock ring for the transmitter assembly, the receiver cap, and a narrow lock ring for the receiver assembly. The F handset, pictured on the right, was introduced about 1937, with the advent of the 300 series desk telephones. The F1 handset remained in production long after production of new 300 series telephones was discontinued in the mid-1950s. 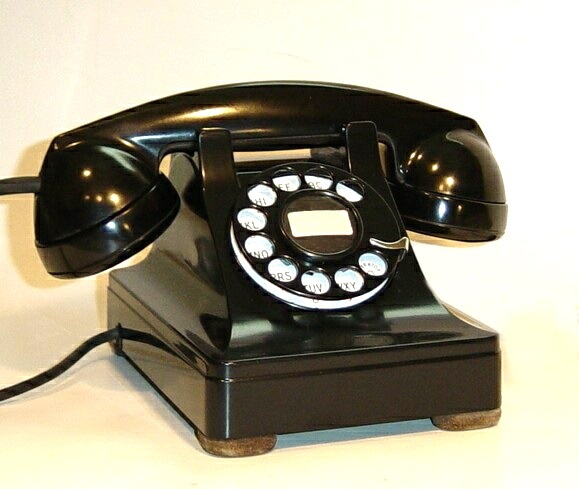 The bakelite parts of the F handset consisted of the handle, the mouthpiece and the receiver cap. After the F1 handset was introduced in 1937, Western Electric and local Bell System companies frequently replaced the older E1 handsets with F1s when B and D-type telephones were refurbished. These updated sets often remained in service for many years, and continued to be included in the Bell System Practices manuals for installers until the late 1960s. By 1930, the B1 handset telephone was discontinued and the D1 handset telephone was introduced. The D1 had an oval base and a new cradle assembly, both made entirely of an aluminum alloy. In mid-1936, Western Electric began producing the D1 base and cradle in a heavier zinc alloy “pot metal.” About the same time, Western also began offering the D1 telephone with the newer F style handset, designed for the new 302 desk telephone. The D1 is often called a “202,” a BELL SYSTEM designation for an antisidetone handset desk telephone. However, D1 sets were configured for both sidetone (102) and anti-sidetone (202) service. After the F1 handset was introduced in 1937, Western Electric and local Bell System companies frequently replaced the older E1 handsets with F1s when B and D-type telephones were being rebuilt for re-issue. These updated sets often remained in service for many years, and continued to be included in the Bell System Practices manuals for installers until the late 1960s. To commemorate the 75th anniversary of the telephone in 1951, the BELL SYSTEM offered the “Imperial,” a special D1 (202) desk telephone plated in brass (at right) or nickel (below). 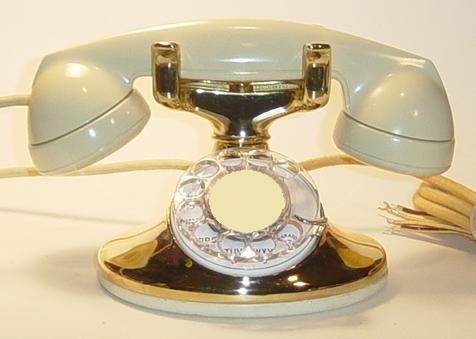 The F handset, plunger, base cover, and accompanying bell box were colored ivory. The brass Imperials were meant to look like they were gold-plated, but they weren’t. The 302 was the first Western Electric desk telephone to be self-contained, with the induction coil, condenser and ringer contained in the same housing as the cradle and dial. The housings of pre-WWII 302s were made of a zinc alloy “pot metal,” and were produced from 1937 to 1941. 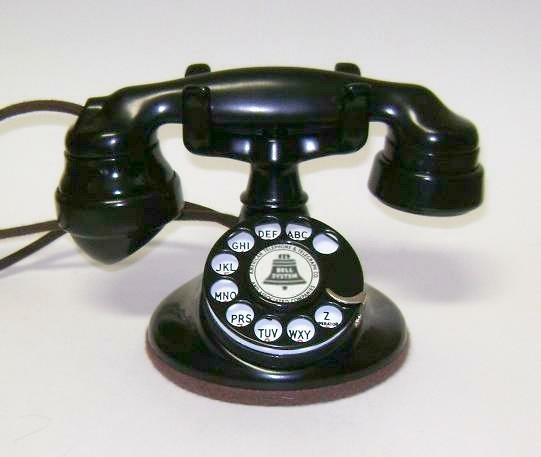 Very early 302s, manufactured until mid-1938, had smaller "ears" and smaller plungers on the handset cradle. Some, but not all, of these earliest "small plunger" 302s also had vents inside the finger grip. These vents supposedly allowed for the ringer to be heard better, but were found to be unnecessary, so they were eliminated. Just before production of telephones for civilian use was suspended in November of 1942, Western Electric began manufacturing their 302s with a new black thermoplastic housing which made the telephone about two pounds lighter. After the war, production of new 302s continued until 1954, when factory production of new 302s ended. However, as with most other Western Electric telephones, both metal and plastic 302s continued to be factory rebuilt for re-issue for many years after the manufacture of new sets ended. Both metal and plastic 302 sets were available in colors. 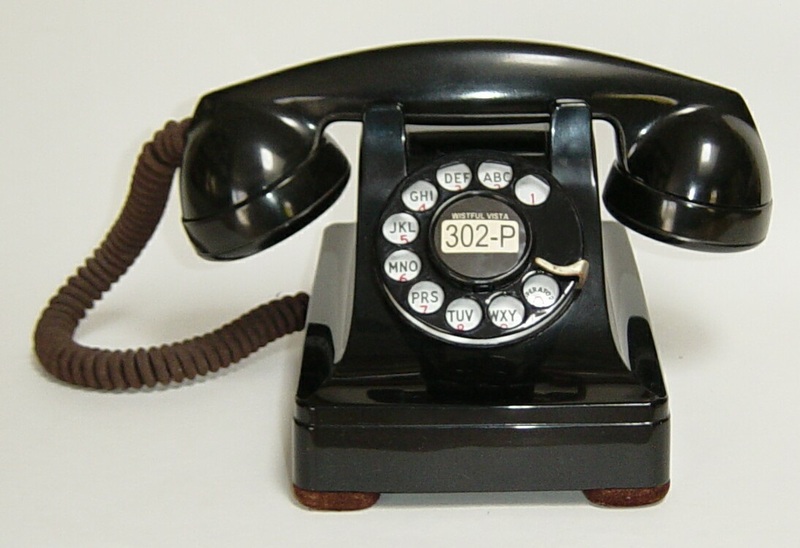 The metal color 302 sets were painted the same colors that had been available for the D1 (202) telephones. Plastic 302s, some of which were available before WWII, were available in ivory, gray-green, rose pink, Peking red, and blue. The ivory plastic 302s are the most common, but are still hard to find in excellent condition. Blue plastic 302s are the rarest. In the early 2000s, a blue plastic 302 brand new in the box, sold for $5,000 on eBay. In 1949, the Bell System began field testing their newest telephone, coded the 500. The 500 contained a new network that proved more effective on longer lines. Over the next couple of years modifications were made to the internals of the 500 set, but it remained fairly unchanged until production of new 500 sets ceased in the 1980s. All material on this website, not otherwise in the Public Domain, including all original photos, essays, articles and commentary, are Copyright 1999-2019 by the Wistful Vista Telephone Company of Hamden, Connecticut, and may not be copied or republished in whole or in part without prior written permission of same.